Don’t be surprised if this cherry Whiskey becomes your summertime fling. Leopold Bros. was founded by Todd and Scott Leopold in 1999. Todd has degrees in Malting and Brewing and Scott has his degrees in Economics and Industrial Engineering. These two brothers have since done the sensible thing and founded a distillery — first in Michigan, then moving everything back to their home state of Colorado. Their core line-up today is winning lots of awards and consists of Gins, Whiskies, Vodka, Aperitifs, an Absinthe Vert, and a few other tidbits. One of the unique things that they do at Leopold Bros. is bringing back old styles of Whiskey. Before prohibition, it was fairly common to flavor Whiskey in the barrel as it aged with fruit juice and spices. It’s a little like what we call a pre-made cocktail today. 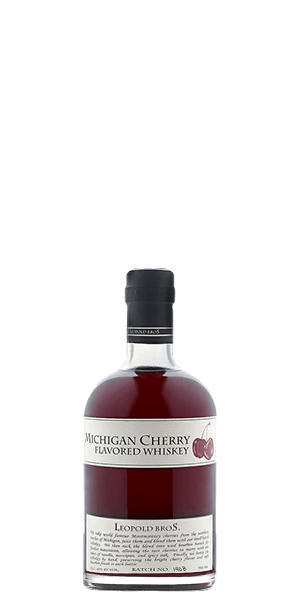 They make five of them, but today we are talking about Leopold Bros Michigan Cherry Whiskey. It starts with their core American Whiskey — a mash of corn and rye aged in oak. Then they add a bit of tart Montmorency cherry juice from Michigan to marry with the Whiskey. The flavor is bright and lightly sweet — almost Manhattan-like — with a rich burgundy color. What does Leopold Bros Michigan Cherry Flavored Whiskey taste like? The Flavor Spiral™ shows the most common flavors that you'll taste in Leopold Bros Michigan Cherry Flavored Whiskey and gives you a chance to have a taste of it before actually tasting it. Cherry and cream with oak and spice. Long and thorough with juniper standing strong. Taste like cherry pie filling. It is rare, so I mix it with 7 up. Taste like cherry pie filling. I like to mix it with a little 7 up. Very sweet. A little too sweet for my taste to drink straight. It works well to make cocktails and even a modified Manhattan. Unique flavor and surprisingly smooth. Tart but good. If you’re into flavored whiskey this is a nice dessert. Cherry is one of my favorite flavors and when I'm trying to pace myself I often mix too expensive whiskey or rye with Dr. Pepper or other cherry colas. This lets me enjoy cherry flavor without pacing myself. ;) If you like cherry, especially the unique taste of Michigan cherries, it's for you. If you don't then not so much I'm sure. Also mixes great with Vernors if you want to stay Pure Michigan! I have to say that it's different. When drinking you get the sweet and tart flavor. If you don't like sweet tasting whiskey don't buy this. I used ice to tone it down. This is way better than Evan Williams cherry flavor whiskey. The Leopold Bros. puts the cherry juice in the barrel for 6 months. Evan Williams mixes a cherry liqueur after the is whiskey aged. Then blended. But the Leopold Bros is triple the price. I tried it neat and it was to tart then sweet. A little rough. I filled a glass full of ice then the whiskey. Let it sit for 5 minutes and had a sip. Way better! Also Way better then Evan Williams cherry whiskey. If you don't like sweet then don't buy this. I will not buy this again. But I don't regret trying it. A unique blend of tartness and sweetness. Very nice! I loved the unique flavor!! Heavy taste of cherry with a whiskey finish. Liked it best chilled and neat. Much too sweet and cloying if you drink it straight. It wasn't as bad a taste as cough syrup, but it was pretty close. I found that it was much better when mixed with seltzer or some other liquor that could help to balance the flavor. But if I'm going to spend this much money on a bottle, I don't want to have to use it for mixed drinks. Very sweet, and tart! Defiantly cherry tasting. Great as a mixer! Wanted to like this so badly, but overly sweet. Consistency too thick. with a splash of 7-up it makes great highballs. It will only get better come summer. light, fruity and refreshing. Far too sweet to be called whiskey. If you added a tablespoonful to a 750 ml bottle of a mild whiskey, it would impart a nice hint of cherry. It was NOT a sippin' whiskey. I was very interested in tying it, amazing color, but it was too sweet for my taste. I like this I really like the cherry flavor in this, the taste at the end takes a little getting used to but overall this is a great whiskey that I can drink with or without mixing. But this. 10 out of 10. Sweet tart cherries. Nice all by itself. Could easily be a mixer. Like the color and boldness. This is maybe the worst tasting stuff I have ever had. Cough syrup with alcohol. Un drinkable. Did not like. Almost syrup like. Would not buy again. It’s is great and not too sweet to drink straight. I prefer to drink it straight. Probably much better as a mixer due to it being much too sweet for me. Would make amazing Manhattans tho. Wonderful cherry taste with the nice bit of whiskey. I want more! Its different. No i did not detect any hints of oak or lamb spleen. Just strong cherry goodness. Taste like a chocolate covered cherry. Wonderful! Have to approach this more like a liqueur rather than a whiskey. Doing so myself, I still thought it'd only be slightly cherry - a hint if you will. No, this delivers on the cherry immensely (wife regularly has cherry juice for health, so I have a control to compare against). There really is no skimp on the cherry flavor (can't see how others have said no fruit)! So, it's a cherry packed whiskey that drinks more like a liqueur - with a punch. With that out of the way, preconceptions should be more appropriate... and possibly allow for appreciation of the baseline spirit that holds this crafted nectar. Like nectar, it is sweet. I first enjoyed neat, then added a clear cube to admire the vibrant color. It's palatable and down right enjoyable as such if you're willing to accept that it's a sweet, cherry whiskey (not whiskey with a hint of cherry flavor - sans sweetness). I immediately thought to fall and holidays (akin to cranberry) and the copious ways to work with this like I would cranberry juice (where I'd like an alcohol addition). First cocktail was an eclectic Boulevardier. I thoroughly enjoyed it as I do the base cocktail. While I'd prefer standard whiskey/rye, I liked the cherry play on the combination. Next I swapped Aperol in for Campari and found that equally delicious. As I write this, I realize I need to do a take on the Paper Plane - so that will come tonight. Whether you treat this as a liqueur topper or base spirit, the flavor is potent and piercing in a way that is workable for custom enjoyment. Play around and find your style if you've already procured - or think you will soon. Enjoy nonetheless. Reminded me of Robitussin cough medicine. Sugary sweet. No natural flavor. Very disappointing. Sweet no natural fruit taste. Very disappointing. Must be enjoyed Chilled or mixed. This is one of the Best! Flavor is Spot On! This will be one to keep on hand at all times. Great taste. Broke out for a family gathering. My brother's are not big whiskey drinkers but were sold on this when mixed with a Coke. Great taste but it is very sweet. We ended up mixing it with Truly - Blood Orange flavored sparkling water. It knocked the sweet down some without killing the flavor much and the Truly helped keep the ABV up vs normal sparkling water. A bit on the sweet side for my usual taste, but with a heavy splash of soda water it makes for an easy-drinkin fruity cocktail. If you like your sweetness to mask a whisky edge, could be for you. If you want a clearerly cherry forward booze. This is for you. Not my favorite drink but it has its place. Also, bottle is gone. I was surprised at how delicious this was! I was somewhat expecting it to be like cherry Nyquil but it's not at all. The whiskey punch was definitely there and the cherry flavor paired well with it. Straight or mixed with a bit of mountain dew, it's superb. I can’t believe how they managed to create and preserve the taste of fresh cherries . Close your eyes and you’ll swear your eating one, until you realize there’s no pit. Very smooth and subtle; not a syrup or gimmick taste. Served chilled, it’s an incredible treat ! The wiskey taste was overwhelmed by the sweetness of the cherry. I really enjoyed this. It's really not overly sweet, but you can definitely taste the cherry... And not in an awful cough syrupy way! Tastes like a cherry spinned old fashioned straight out of the bottle! Interesting cherry infused whiskey. It was not medicinal tasting at all. Similar to a liqueur but not syrupy. I had it on ice. It was smooth and the cherry flavor is definitely there. I am going to try it with coke next....maybe plain old coke or cherry coke. Perhaps it was the way I served it, but it reminded me of cherry cough syrup. At first I thought this was a cough syrup - very sweet & no bourbon flavor. But that was wrong. The cherry is very sophisticated and warming. Sad that it has to be kept in the fridge and drank in 60 days once open, but this is so delightful it will not be a problem. This is the second time I've ordered this. Great for sitting around the campfire and sipping. Come this October I will repeat the experience. Maybe make some Jello shots. Strong cherry smell. Equally strong cherry taste, with a rather strong finish, not unlike cherry-flavored cough syrup. However, mix it with cola, and you've got a fine drink. I loved the cherry taste and how smooth it was to drink. I would have to put this whiskey as one of my favorites. It was a very refreshing and stimulating taste. Was very pleased by the perfect balance of the cherries not to overwhelming and just enough of the right flavor to want more. Too much like cherry syrup. Trying to find and alternative use for this. I cannot serve it straight. Way too sweet. Hi Andy, any luck with alternative uses? I tend to pick up sweet notes very easily so this would great info. I really liked it. It IS sweet, and maybe more sweet than it needs to be. But the comparisons to cough syrup are off base: it tastes fresh, like ripe Michigan cherries soaked in good bourbon whiskey. Real cherries and real bourbon. Very tasty. And as a Michigander, I thoroughly enjoyed it! It was a little too cherry to drink straight, however it is delicious when mixed with a coke. It did have a good backbone behind the cherry. It was excellent and I share it with some of my friends and they loved it and some became members and other want to. I highly recommend it and if you refrigerate it the taste is better. I'll be honest. Straight, this tastes like cough syrup. However, it is a gorgeous mixer and makes a great old fashioned or bourbon and coke. I'll definitely buy again if it comes back, but could not rate it higher without being able to drink it straight. Too sweet when consumed neat. However, I can see possibly mixing a cocktail with it. This stuff is fantastic. Great for mai tais and whiskey sours. Even straight up. I found this whiskey to have a wee burn when straight, a great cherry flavor on first tasting and just a bit of smoke to it. When mixed into a whiskey sour, it was quite delightful. All in all, it is a smooth whiskey and anyone that doesn't want theirs can send it to me. The cherry was overpowering and gave it a much sweeter taste than what I would prefer. Tasted more like juice than whiskey. Not terrible to have in your collection for those that want to try something different. I, however, was hoping for just a hint of cherry not cherry juice with a hint of whiskey. I really enjoy the tart cherry flavor, with the hints of caramel sweetness and little oakiness. I have really enjoyed just sitting and sipping this poolside enjoying some sun. Definately cherry, good mixed. I cant see drinking it any other way. I love it!!!! I love it straight right out the freezer!! This was really sweet and thick- reminded me of cough syrup. If you're looking for a mixer, this would work. If you're looking for a sipper, this isn't your best option. There are some great cherry whiskey makers in Michigan and would be worth trying instead of this. Hi Jennifer, do you have any recommendations for those Michigan cherry whiskeys? This is a cordial, not a whiskey. It should not be classified and sold as a whiskey. That said, as a mixer, say as a replacement for vermouth in a Rob Roy or Manhattan, or instaed of simple syrup in an Old Fashioned... Quite drinkable. I love cherry, but straight this is a little much. I mix it with Sprite or 7 up. I liked the whiskey but not the cherry taste. Too much of cherry. The whiskey was good , it had nice taste but the cherry was much. Tone it back 2/3 so there is lighter taste of cherry. This was a good mixer with Coke or Dr. Pepper. Terrific cherry flavor. At first I found myself disappointed with this buy. I didn't find it very drinkable. It tasted pretty much like cough syrup and had a weird nose. After I while though I have come to enjoy it more. It is a good change of pace and solid summer sipper. It is a little too heavy on the cherry. While it is tasty, even when mixed with cola, for a kind of cherry-coke, it was still too much overpowering cherry flavor. Didn't try it in coffee because I couldn't imagine how strong it would taste when warm! Not a fav of mine, but glad I tried it. very cherry tasting..sweet but just enough to make you enjoy it. Nice warmed up for after dinner drink and good in coffee. Unbalanced, starts and ends with a unsatisfying fulfillment, they may have tried to cram too many flavors together as their is little to no balance. I’m so disappointed. I enjoyed this more than I thought I would. I was worried it would be too sweet, but it it was a lovely balance of sweet with tart. I ended up mixing mine with ginger ale and it tasted like the ginger ale that is released around the holidays that has cranberry added. Wanted to like this but just couldn’t. Best experience with this is burying it in another drink. Chilled is the way to go with this. I put mine in the freezer. However, it doesn't take away from the overwhelming tart taste of the cherries. It over powers all the other flavors. I would imagine this would be better in some type of mixed drink, rather than drank straight. Why did you give it 9 stars? Too sweet for my whiskey taste. A little sweet for me. Goes good with some type of mix. A great cherry flavor, and not medicinal like most cherry products. Sweet, but easy drinking straight or on the rocks! Would definitely purchase again. I love the cherry flavour, but this one is way too much. Too sweet for my taste. Fits well into something like whiskey ginger, but not great by itself. Would not buy another. This is really wonderful! Cherries and vanilla, with a little sparkling water! Love it! The cherry was overwhelming out of the gate. Too thick, too sweet. I tried my hardest to find anything whiskey in this but it just wasn't there. After a couple drinks it left me with a severe headache unfortunately. I tried hard to like it but just wasn't to be. I'll be experimenting with it to see if we can come up with an interesting mixed drink. Excellent to sip! Very flavorful. Will definitely buy again. When I opened the bottle, I could smell the cherry right away. Smelled very good. Tasted good as well, but it seemed a bit like a mash of cherry Hi-C fruit juice & whiskey blended together. Very sticky, as I handled the bottle during the pour and it ran down the neck of the bottle. I had a little headache, probably from the sugar, after a few glasses. It cured my curiosity. I won't be buying another. This isn't grandma's cherry juice. While the drink is a little sweet at the start, the bold cherry flavor with a true, tart cherry finish, will make you glad you ordered it. Sip and enjoy. Sweet, but with a kick. Definitely just for sipping in small quantities. Nice tart finish. Excellent sipping drink. Full cherry flavor finish. Much better than I expected. Very good. Very sweet, very smooth. A little too sweet/syrupy for my taste, but definitely has a good cherry flavor. Very sweet yet it has a great aftertaste! Leaves the back of the mouth warm and numb! I'd definitely buy it again. Very smooth, initially rather sweet, but finishes with a somewhat tart cherry. While I agree in part with some of the "liqueur" comments, I didn't feel it was a semi-thick consistency. Great for sipping in front of the fire and a delightful change of pace. I enjoyed this so much that I've just ordered 3 additional bottles! So smooth that you will hardly know you're drinking whiskey. A rich, semi-thick consistency like a liqueur. Very sweet and with a soft cherry flavor. I joined Flaviar specifically so I could order more and get the discount/free-shipping on this whiskey. Very smooth, no doubt you can taste the cherry, with a very full body that’ll coat your mouth. However, in my opinion, I would almost consider this more of a liqueur or after dinner dessert drink similar to a Port, in case you are thinking it to be more like a traditional whiskey. This drinks more likes liqueur than s whiskey. It’s very sweet. The cherry is the driving flavor here. That being said it is very tasty with a fresh cherry flavor. In fact the bottle requires refrigeration after opening to maintain freshest flavor. The bottle also informs that peak flavor declines after 6 months so plan to drink accordingly. If you like cherry flavor I would highly recommend this. It’s probably a great cocktail mixing ingredient. If you want to add cherry flavor and sweetness to any drink this is the one to use. As a cherry lover I felt the flavor was spot on! Recommend not drinking itmon the rocks. Shared it with my family while camping. Everyone loved it. Suggested I get more to use as cough medicine instead of OTC stuff that doesn't work any way. Yummy! I loved this ! The cherry flavor came through with a sweet tart taste. Will definitely purchase this again. Smooth and definitely tasty... The one that easily gets the job done. It was a bit sweeter than I thought it might be, but I soon started craving it. More please! I was so worried that this would be too sweet and too artificial, but I was so pleasantly surprised! the tartness of the cherry compliments the whiskey so well, and it's way too easy to drink. I thought it was a little bitter, all in all, not all that bad. The cherry flavor is so sweet and pronounced that it goes down so smooth. Don't be surprised if you order it more than once. Definitely a deep cherry flavor. The sweetness comes through. I prefer more sweetness, though. For 80 proof the flavor and sweetness is incredible. Absolutely great flavor! Great balance between sweet and tart. A little on the sweeter side but very enjoyable on the rocks.